Hello and welcome back to my favourite blog series EVER. In case you're new here, my name is Becca and I'm a bit of a cream tea fiend. So, I'm currently on a mission to find the best cream tea on the south coast. You can read my previous posts in this series here, and let me tell you, there have been some goodens. 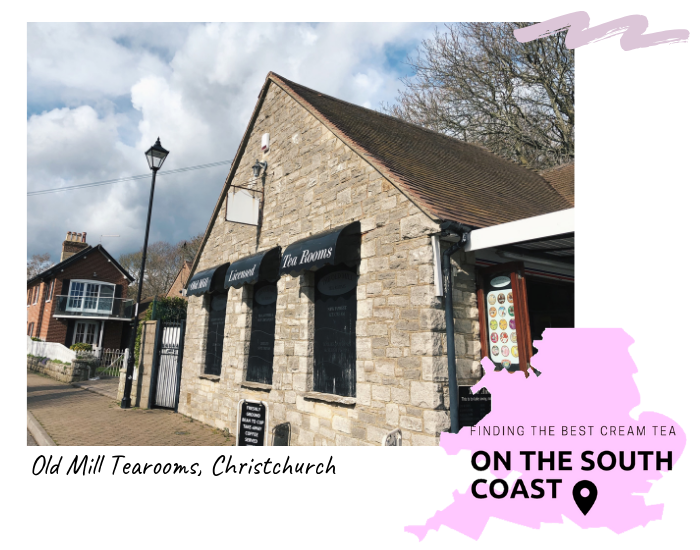 Today's location is the Old Mill Tearooms in Christchurch - located right by the Quay. Of all the places I've visited as part of the series this is definitely the most basic one yet. I'm going to be honest, it's a very no-frills tea room with a bit of a supermarket cafe kinda feel to it! I had a plain and a fruit scone, and let me tell you, they were MASSIVE. I'm talking so big I couldn't actually finish them kinda massive. They weren't the tastiest scones I've ever had and got a bit gritty towards the end... They certainly weren't horrible, but they weren't amazing, yanno? Now, for what is essentially 4 scones, there definitely wasn't enough cream for all four (in my opinion) as you can tell from the picture! The cream did, however, come in a little china pot - much better than the paper cups provided in other places! For two massive scones, the jam, cream and a pot of tea, £6.25 isn't too bad of a price, no? The lady serving us also said that we could go up and ask for more tea if we wanted - so the price is very reasonable in my opinion. Now, this tea room doesn't score any points on aesthetics. It's very basic indeed and there certainly aren't any instagrammable flourishes - there are no cake stands nor fresh flowers to be seen. The location is by far the selling point of this tea room! It's right on the quay, overlooking the water. It's in a really good spot if you've spent the afternoon going for a wander and fancy some light refreshment! There are also tables outside, so, on a summer's day, I can see this being a very popular place indeed. Where shall I visit next? I remember visiting Christchurch when I was little, but I don't think I ever went here. It sounds pretty good, the scones look huuuge!